A sweet rhyming adventure about spending quality time with your kids is the latest from Kevin McNamee. 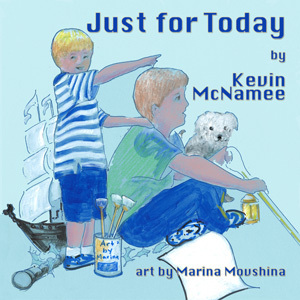 Just for Today finds a young boy asking his father to stay with him and have a few adventures: outrunning pirates on the high seas, finding buried treasure, going on a safari, and more. I’ve been a fan of McNamee’s work for some time. His lyrical prose flows nicely and his stories all show a vast amount of imagination. In Just for Today a young boy is trying to convince his father to stick around so they can play together. This is a nice message, reminding kids and parents how important it is to spend time together. Marina Movshina provides the artwork for this story. While I usually enjoy Movshina’s work, I didn’t care for the style used here. The outlines were crisp, but the details were fuzzy as if we were seeing the characters from far away instead of close up. In addition, in some illustrations the father looked like an adult, but in others he looked like a teenage boy. That said, I believe many youngsters and their parents will enjoy this rhyming adventure. I received a PDF version of this book from the author. This review contains my honest opinions, for which I have not been compensated in any way.